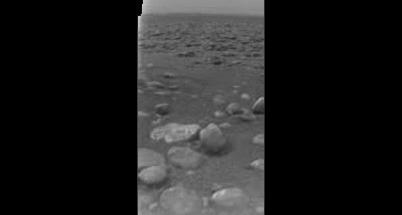 Actual image of surface of Titan taken by the Huygens probe which landed on Titan in 2005. Lately the media has been buzzing about the possibility of methane-based life on Saturn’s moon Titan. As usual, when scientists include the words “interesting,” “odd,” “life,” “extraterrestrial,” and “discovery” in the same press release, the media starts creating misleading headlines that make people think we’ve discovered extraterrestrial life. Chill out, folks, that’s not the case here. Basically what they found is that, in the hydrocarbon lakes on Titan’s surface, there is much less acetylene than expected, based on other measurements taken by the Cassini probe, currently orbiting Saturn. They also found via a computer simulation modeling the atmospheric conditions on Titan (not direct measurement) that there is also much less hydrogen at the surface than there should be. These are intriguing results, and deserve much further study, but methane-based life on Titan is just one of many possible explanations, the rest of which are non-biological. Good articles explaining this further can be found at Universe Today and Bad Astronomy, but the best explanation comes from Chris McKay at the NASA Ames Research Center. He’s one of the astrobiologists working with the Cassini mission, and states the facts very clearly (at least if you’re vaguely familiar with biology and/or organic chemistry. For a little bit more “laymen’s terms” explanation, I recommend reading either the Universe Today or Bad Astronomy articles.